Would you like something unique? I've been drawing and painting from an early age, initially for pleasure but mostly as a professional signwriter for the last 30 years. Much of my work has been based on commissions for drawings, signage & decorative paintings, some examples of which can be seen in my Gallery. I hope you enjoy looking through my completed projects and I look forward to working with you. Welcome to my eclectic collection of work! I enjoy taking commissions of pets, there are so many different characters. We love them all in our own unique way and I enjoy capturing their character in the pen and ink medium I use. As an animal lover and beagle owner I know how they can steal your heart! Would you like to commission me for a pet portrait? I like to work from high quality photographs please. You can send as many photos as you think will be helpful. Clear images need to show the fine details of your pet. Photos taken outside are best, not into the sun but with it behind you. Ideal photos are taken on a cloudy bright day where there are no harsh shadows evident. Try to get as close as you can, at their eye level for a head and shoulders portrait. No squinting allowed! You don’t need an expensive camera as most cameras on smart phones will provide good enough images to work from. Please remember I can only draw what I can see! of one subject I charge £250.00. approx size for one subject is 17in x 15in. 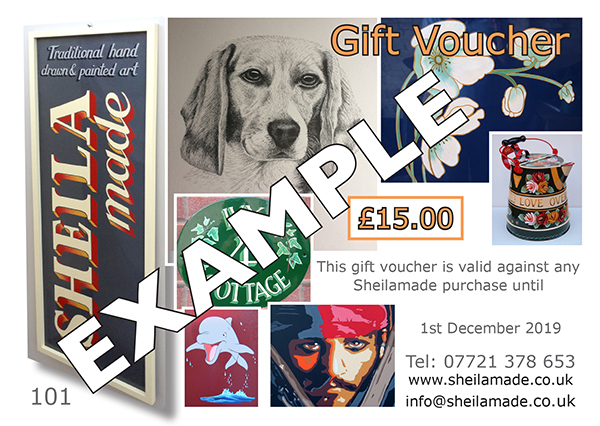 valid for 1 year redeemable against any Sheilamade purchase. your message to make an ideal gift. Commission a personalised name plaque for your home: letters or numbers! Below are a couple of examples, they can be varnished or painted and signwritten with your choice of colours. No.1 is a framed painted panel and was £62.00. Ivy Cottage is unframed and painted and was £120.00. I am a self-taught signwriter. There are reportedly around 300 signwriters carrying on the age old tradition of signwriting throughout the UK. With brush and paint in hand we carry out our craft to the marvel of many an onlooker. Shops, churches, boats, pubs, to name but a few. So why not commission your own piece of wall art - framed as a picture to hang on your wall, and help to keep the tradition alive. I have a number of prints available to order from my Gallery or commission your own picture for me to paint, which can be mounted and framed to take pride of place in the room of your choice. Below is a selection of prints currently available, they include a mix of drawings and paintings. I am self taught in the art of traditional roses and castles decoration as well as traditional signwriting often seen on canal boats. Having been practising for almost 30 years I have developed my own style of decoration but still adhere to the principles of the old tradition. are available to order, see price list below. I hope you've enjoyed looking at my completed projects and I look forward to working with you.